Berlin may be a popular tourist destination – rich in history, from the former Berlin Wall to the 18th Century Brandenburg Gate, but there’s much more to this great German city than what crowded concrete can tell. For those with a couple of days to spare, there's a wealth of dedicated cycle routes through gloriously flat, wooded landscape in the surrounding state of Brandenburg, that is as rich in history as the city - if you know where to look. Luckily our guide, Regina, knows where to look. We’re headed out along part of the 350km Berlin-Usedom trail, one of the most popular cycling routes in Germany, which runs from Berlin city centre, through Brandenburg’s rich, forested countryside, to the coast. The plan is to peel off at Joachimsthal to head South on the Tour Brandenburg route, before turning West, making the shape of a letter P.
You probably wouldn’t buy a bike if you’re visiting a country for a couple of weeks. I probably shouldn’t have done, either, but taking a bike to Berlin by train proved tricky and I convinced myself it was a good idea to bring all the kit, and just buy a second hand bike when I got there. I'd planned to sell it before I left. It was a bit like a holiday romance - me and this steel-framed Trek with pannier racks and grip shift gears. So it was me and my bike-on-the-side hopped on a train with tons of space for bicycles and made our rendezvous with a group of German journalists in Bernau, around 10km North of Berlin. Once they finished taking the mickey over Brexit, we set off. The pleasing legend of Bernau goes that, in 1140, Albert I of Brandenburg stopped at an inn here, and like the beer so much he declared, as only Medieval royalty could, that the settlement should be made a town. Bernau, whose name derives from German ‘bear’, threw itself headlong into brewing. One can only imagine how much beer was consumed in those heady years to warrant the fact that, at one point, 100 of the town’s buildings produced some form of malted tipple. Bernau is surrounded by a wall which today includes a brand new, Medieval red brick tower. Knocked down circa the 19th Century because its gateway was too narrow for hay carts, it was recently rebuilt to the same dimensions. Cleverly, the town joined forces with a Polish town also looking to rebuild an old tower, to bid for EU funding (a little sigh escapes). The resulting edifice prevents two way motor traffic from entering the town, making the streets pretty free of traffic; the downside being modern fire trucks can’t get through, either. Most of the Medieval town survived WWII only to be flattened by post-war Soviet occupiers and replaced with modern buildings. Perhaps it was best the wood and plaster buildings went. The Mayor’s house burned down twice. The temperature’s above 30 and still rising as we follow the cycle trail North, undulating gently through alternating warm shade and blistering sun, depending on the trees overhead. We eventually find shade under Biesenthal’s 130-year-old Great Oak (the original was destroyed by lightning; presumably there was fire, too). Beside this once stood a grand old hotel, which was deliberately burned by Soviet occupiers, who would also torch homes containing images of Hitler. Sticking with the conflagration theme, we’re told a hapless woman in earlier times destroyed most of the village after leaving a stove top open while everyone went off to work in the fields. Ouch. We forge onward through the forest, and it feels like we’re cycling into a furnace. Between the luminous leaves of beech, silver birch and pine, fields appear, exposing us to the full force of the hot Brandenburg sun. We stop at Marina Marienwerder, beside the Oder-Havel canal, for lunch. There’s seating under umbrellas and we run into the sprinkler like grateful children, soaking our clothes and hot faces. Boating holidaymakers laze in the shade, while the café proprietor tells us his vision the canal will one day carry tourists from the Netherlands and Sweden. He likes boaters because they aren’t in a hurry. After another 30 minutes we stop for local eis, and to meet the forest’s head hunter, who plays a Jagd (hunting) horn, keeps a large brindle hound, Jari, and says there’s a thousand trees over 200 years old in the forest; he seems a content man. He plays us a tune on the horn, and to our delight, the dog sings along. Only one in ten hunting dogs will do this, so it’s pretty special. Huntsman and singing dog, Eichhorst, Brandenburg. Apparently only 1/10 hunting dogs will sing. Rather loveable. This area is part of the Schorfheide-Chorin UNESCO biosphere, one of Europe’s largest mixed forests. It was also once Herman Goering’s hunting ground, and before that the Prussian princes’. Goering had bison, and any number of wild exotic animals, brought in for shooting. When the Russians came the bison were killed, but legend has it one survived in the woods for some years afterwards. I wonder if bison get lonely. A great red sandstone relief of a bison installed in Goering’s time, partially destroyed in the years after the third Reich fell, was discovered lying smashed on the ground, restored and its face rebuilt. Now the monument stands, with oak leaves replacing swastikas. I don’t know how he gets ahead of us. We round a corner and our head hunter stands atop a mound beside a stone tower, the Jagdschloss Hubertusstock, playing his jagd horn again, but without the dog. Each tune represents something – a welcome, a farewell. This tower, it transpires, was once surrounded by a wooden fort, basically your regal hunting lodge for royal bows and arrows to wreak havoc on the local deer population. Now tourists can pick up the key from a local café and climb up. It’s a great spot, overlooking the Werbellinsee. We paddle in the cool green water, to marvel at the expanse of sparkling water surrounded by thick forest, as two girls collect pond weed and splat it on the stones to dry. Which brings us to the subject of lakes. Brandenburg is a state of 3,000 lakes, so they say, many of them joined by streams, some by larger canals, so it’s possible to travel long distances by boat or, in our case, to cycle around and swim in the lakes. We hightail it to a former hunting lodge, now Jagdschloss Hubertusstock, a hotel and conference centre whose “forest villas” were once used by pals of former government ministers for weekend jollies. To get between them you run the mosquito gauntlet, on foot or bike. The post-WWII GDR leader, Honecker, came here in February and November to shoot the hell out of the wildlife. There’s stag’s heads and antlers everywhere, so many they decorate the outside of the buildings, as well as the inside. So many, indeed, there’s an entire swimming pool still full, we’re told, of skulls and horns. 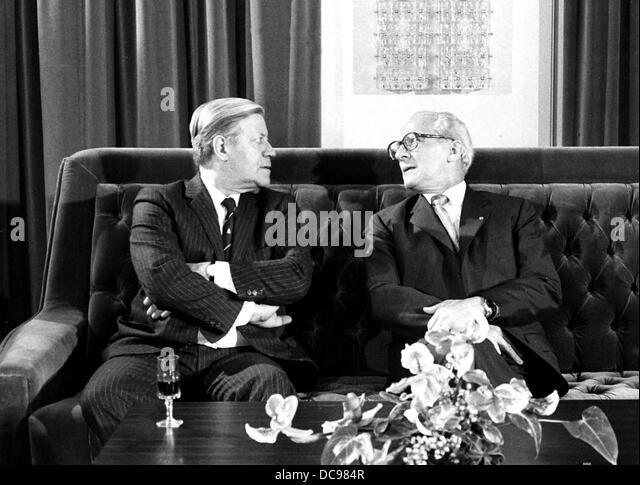 This photo, of he and West German leader, Helmut Schmidt, was taken there. The sofa they sat on is still in the foyer. You can arrange a tour of the building he once used, and see the entrance to his escape tunnel, leading from the hunting cellar (a dining room lined with ear to ear deer skulls), to emerge in the forest somewhere. You can also stay in Honecker’s suite, his bathroom a 1970s riot of modernist white and pea green. We cycle off for a quick dip in the Werbellinsee, before dinner. We’re up early the next morning to clamber up what was once a water tower, but is now a human house with a lookout platform on top. The privately-funded Biorama Projekt is intended as a gateway to the Biosphere, which you can peer down on from Easter Friday to the end of October, Thursday to Sunday. It’s not far from here to Joachimsthal Kaiserbahnhof, and the year 1898. A remarkable thing, a train station designed solely for the use of one person – and his entourage – the last German Emperor, Willhelm II, so he could easily come and go and shoot things in the forest. The building is a real beauty, though, from the carved wooden dragons on the gables, to the original paintings of woodland flora and fauna, remarkably surviving on the interior walls despite the building being split into flats for some years, and presumably redecorated. Today tourists can use the station, which is on the Niederbarnimer Railway line. You can even get married there. We wend our way through rougher territory, over cobbled and stony tracks through forest, as well as the smooth tarmac we’ve become accustomed to, before emerging to the grounds of the impressive Gothic brick edifice of Kloster chorin – an abbey where second sons of the wealthy – the ones that weren’t set to inherit – were sent to be educated and generally kept out of trouble. Now, each year the Abbey stages classical concerts, at the popular Chorin Music Summer Festival, which are often sold out well in advance. They’re held in the cathedral building, which is open to the elements on one side. We visit the blissfully cool cellars, while our guide describes the public exhibition that will one day be here. You can still see dog paw prints in the floor, from canine companions that lived with the monks hundreds of years ago. We’re hardly dressed for a classical concert, sweat drying on our cycling clothes, but no one seems to mind, as we take our seats towards the back of the cool cathedral. Heavy rain falls, and then stops. Thunder and the wind in the trees accompany the music and we try to stay awake after our exertions as the temperature, thankfully, begins to drop. A local character named William, who keeps a Pickelhaube on the dashboard of his white van, gives us a lift, as a biblical rain pelts the ground. Branches fall in the road, where rivers bubble and run. We can’t see anything. All sunny European adventures must come to an end, it seems. Moments earlier you couldn't see beyond the bonnet for rain. Streams running off pavements. Lighting, the lot. Bonus German helmet on dashboard. The storm clears, and we dine in Honecker’s former boathouse, a treat available to guests for a fee. Rain falls again, and stops, and we look out across the lake, its soft smooth surface reflecting the purples, pinks and warm yellows of the sunset sky. Water runs off the roof onto the water and tall reeds rustle and whisper. I get the seat at the end of the table, reincarnating the spectre of the Brexit joke that won't die. You can’t go to Germany without seeing some German engineering. Well, you can, but we didn’t. Regina leads us to the impressive boat lift near Niederfinow, back on the Oder-Havel canal. Built in the early 1930s, it’s had less than a fortnight of non-operational days since. It’s survived war, Soviet rule, innumerable ships and weather over the past 80-odd years. However, its capacity is no longer enough for the number and size of ships coming through, so a new ship lift is being built alongside it. You can walk right to the edge of the old structure, wave the boats descending and ascending, and see the mechanism almost silently glide up and down as small birds whizz past over the dizzying height. We do the obligatory waving at the people on the ships, and watch them descend as large freight vessels line up on the canal far below. From here we turn off the Tour Brandenburg which, incidentally, skirts the entire state, and head West along the Oder-Havel Radweg (the canal cycle route), spotting signs denoting which bridge and which road was funded by the EU, and laughing-slash-crying back to the train station at Eberswalde. I didn’t manage to sell BOTS on the numerous Facebook and Ebay groups available to Berlin’s ever morphing population, so I ended up riding it to a local refugee centre, which fixes up bikes to give to new arrivals to Berlin, many of them fleeing fighting in Syria. I waved it goodbye, and hope it has as many good times with someone else, albeit for a longer time. I also promised myself I’d come back and cycle the whole Berlin-Usedom trail some day, maybe with my own bike.